148 State Street is located in Boston's historic Faneuil Hall neighborhood. Within a short walking distance are some of Boston's most popular attractions, including the Boston Long Wharf, Faneuil Hall Marketplace, New England Aquarium, Freedom Trail, and Boston City Hall. The area also offers many popular Boston restaurants and hotels. 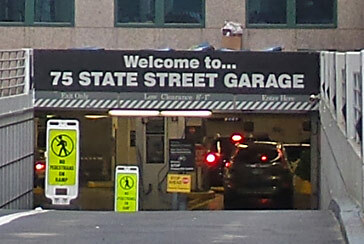 Parking.com offers convenient parking near 148 State Street. Use the interactive parking map to compare parking rates, find nearby parking, and to reserve your spot ahead of time.